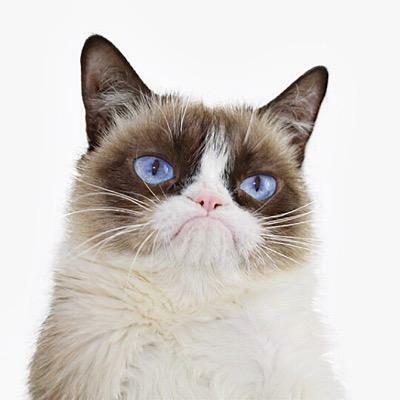 The first and most popular feline celeb, Grumpy Cat a.k.a. Tardar Sauce, became an internet meme when her owner, Tabatha Bundesen, posted her photo on Reddit in 2012. The rest, as they say, is history! Tard’s infamous scowl was shared so many times she became an instant internet celebrity. “Tard” is now a full-time business and spokescat for Friskies cat food. She even has her own Christmas TV special! 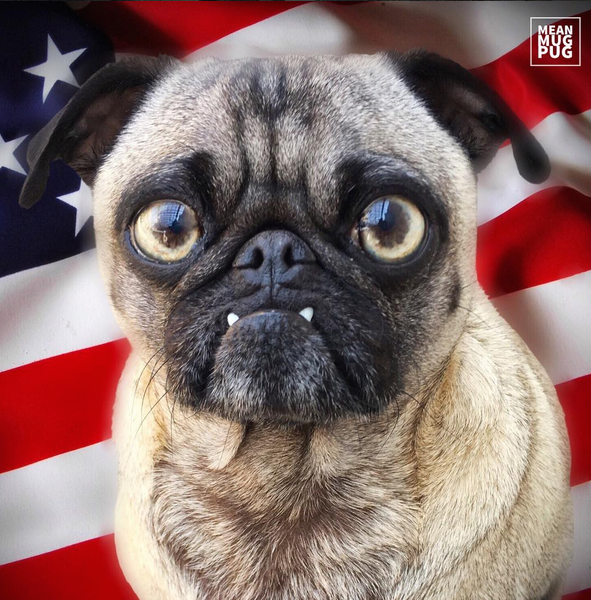 Ozzy the Mean Mug Pug was adopted in 2015 from the Central Coast Pug rescue in California. After dressing her up in adorable outfits and making posts as grumpy Ozzy, her photos went viral and were shared across the ‘net. Ozzy currently has almost 60,000 followers on Instagram and over 100k followers on Facebook! 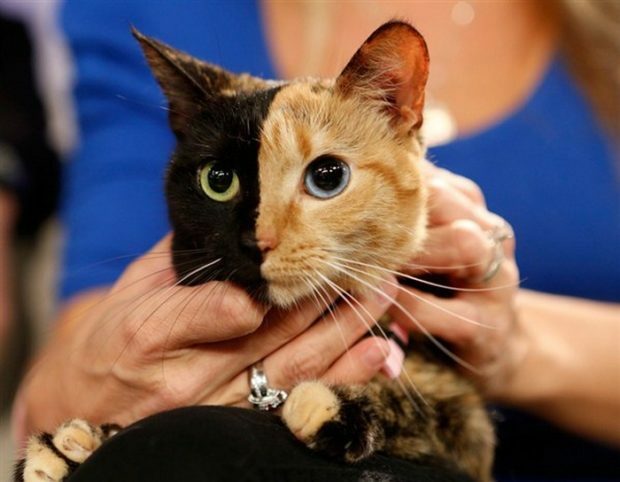 Everyone thought that Venus the Two-Faced cat was Photoshopped–one half of her face was solid black with a green eye and the other was orange tabby with a blue eye–split right down the middle! But the owner proved everyone wrong by posting videos of Venus online, and her uniqueness paid off! Now Venus has millions of followers on her social nets and was even a guest on the Today Show! Does your pet have a unique feature? It all starts with one thing that makes your pet stand out from the rest and grab attention. A funny expression, a funny face, or a unusual talent. One dog peed for several minutes while standing on its front two legs in one viral video. Another cat enjoyed skateboarding. If your pet has a unique feature, still photography might be enough to fulfill your fan base, but get ready to shoot lots of video if your pet has to show off a talent or you have to prove they’re not Photoshopped! Did your iguana call “9-1-1” when you were having a heart attack? Or did your cat save a child from a dog attack? If your pet has a great story, that helps in getting the public’s attention–and will definitely help get media mentions, too! But be careful and don’t fabricate your pet’s story. The internet is not too forgiving if you lie and you could easily ruin your reputation–and potential career! The pet owner has to commit to spending a LOT time working the business. That means recording, photographing, and posting to the various social networks on a regular basis. The hours it takes to maintain internet celebrity can be more than a full-time job. Don’t think that you can post a couple of cute pictures and let it go. It takes constant marketing and social engagement! Don’t exploit your pet to become rich. Don’t disrupt his or her life or make him do things that he doesn’t want to do. Make sure each activity and/or photo is humane and fun for your pet. Reward them with praise and by giving them “goodies” or treats for participating. It can be a great bonding experience for you and your baby if you do it right. If your pet eventually does find its celebrity, then give back. Take him/her to children’s hospitals, pick a cause and donate some of your pet’s earnings toward a charitable animal organization. Not only will it help with the press, but you’ll feel more fulfilled as a stage-mom or dad and you’ll know that you’re doing some good in this world. And of course, the NAME! See our Pet Name Tips and start from there. Be careful you don’t use anything that has been previously trademarked, and make sure you can get the domain name (and social network names) for marketing purposes! Your pet’s name will be its brand. If you’re successful in all of the above, you might even get a couple pet agents coming knocking at your door, trying to get a piece of the pie (your earnings, if there even are any). But don’t adopt a pet just because you think they might have “star potential.” If you’re lucky and know the right hashtags, you’ll be lucky to get a couple thousand Instagram followers. But that doesn’t translate to big bucks. Just like human celebrities, it’s few and far between.